WILMINGTON, Del.--(BUSINESS WIRE)--Dec. 4, 2014-- Incyte Corporation (Nasdaq: INCY) today announced that the U.S. Food and Drug Administration (FDA) has approved Jakafi® (ruxolitinib) for the treatment of patients with polycythemia vera (PV) who have had an inadequate response to or are intolerant of hydroxyurea. Jakafi, an oral medication, is the first and only product approved by the FDA for PV, a rare and progressive blood cancer1. “The approval of Jakafi represents an important advance for patients with uncontrolled PV. For the first time we are able to provide these patients a treatment that has been shown to provide effective and consistent control of their blood counts and reduce spleen volume,” said Srdan Verstovsek, M.D., Ph.D., Professor, Department of Leukemia, Division of Cancer Medicine, The University of Texas MD Anderson Cancer Center. PV is a myeloproliferative neoplasm (MPN) and is typically characterized by elevated hematocrit, the volume percentage of red blood cells in whole blood, which can lead to a thickening of the blood and an increased risk of blood clots, as well as an elevated white blood cell and platelet count1. PV may occur at any age but often presents later in life, with a median age at diagnosis of 60 years1,2. Approximately 100,000 patients in the U.S. are living with PV3. Current standard treatment for PV is phlebotomy (the removal of blood from the body) plus aspirin. When phlebotomy can no longer control PV, chemotherapy such as hydroxyurea, or interferon, is utilized4,5. Approximately one in four (~25,000) patients with PV are considered uncontrolled6,7 because they have an inadequate response to or are intolerant of hydroxyurea, the most commonly used chemotherapeutic agent for the treatment of PV. Patients with PV who fail to consistently maintain appropriate blood count levels, including appropriate hematocrit levels, have an approximately four times higher risk of major thrombosis (blood clots) or cardiovascular death8.Patients with PV can also suffer from an enlarged spleen, and a significant symptom burden which may be attributed to thickening of the blood and a lack of oxygen to parts of the body9. These symptoms commonly include fatigue, itching, night sweats, bone pain, fever, and weight loss5. 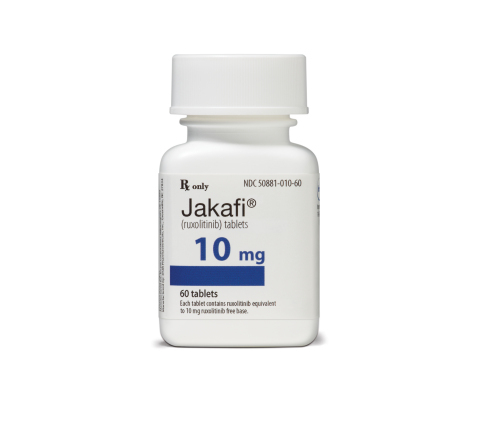 Jakafi is also the first and only FDA-approved product for the treatment of intermediate or high-risk myelofibrosis, a closely related blood cancer. Jakafi is a JAK1 and JAK2 inhibitor that targets overactive JAK pathway signaling, which plays a critical role in the development of both myelofibrosis and polycythemia vera10. “The team at Incyte is proud that a second indication has been approved for Jakafi, further confirming the strength of our science and our commitment to discovering and developing innovative treatments for patients with cancer,” said Hervé Hoppenot, Incyte’s President and Chief Executive Officer. The approval of Jakafi for the treatment of patients with polycythemia vera who have had an inadequate response to or are intolerant of hydroxyurea was based on data from the pivotal Phase III RESPONSE trial, which was conducted under a Special Protocol Assessment from the FDA. In this trial, patients treated with Jakafi demonstrated superior hematocrit control and reductions in spleen volume compared to best available therapy. In addition, a greater proportion of patients on the ruxolitinib treatment arm achieved complete hematologic remission - which was defined as achieving hematocrit control, and lowering platelet and white blood cell counts. In the RESPONSE trial, the most common hematologic adverse reactions (incidence > 20%) were thrombocytopenia and anemia. The most common non-hematologic adverse events (incidence >10%) were headache, abdominal pain, diarrhea, dizziness, fatigue, pruritus, dyspnea and muscle spasms. Incyte established IncyteCARES (Connecting to Access, Reimbursement, Education and Support), a comprehensive program that connects patients to ongoing support and resources during treatment with Jakafi. The program offers access to trained nurse professionals and financial support for eligible patients, as well as access to ongoing education, tools and resources. Incyte is committed to helping appropriate patients get access to Jakafi and support through IncyteCARES. Incyte will provide Jakafi free of charge to eligible patients who do not have insurance and will also offer co-pay assistance to eligible individuals with commercial insurance. More information about IncyteCARES is available by calling 1-855-4-Jakafi (855-452-5234). Except for the historical information set forth herein, the matters set forth in this press release, including without limitation statements with respect to the potential efficacy, safety and therapeutic value of Jakafi® (ruxolitinib) in uncontrolled polycythemia vera, contain predictions and estimates and are forward-looking statements within the meaning of the "safe harbor" provisions of the Private Securities Litigation Reform Act of 1995. These forward-looking statements are based on Incyte’s current expectations and subject to risks and uncertainties that may cause actual results to differ materially, including unanticipated developments in and risks related to the efficacy or safety of Jakafi, the results of further research and development, other market or economic factors, competitive and technological advances, and other risks detailed from time to time in Incyte's filings with the Securities and Exchange Commission, including its Quarterly Report on Form 10-Q for the quarter ended September 30, 2014. Incyte disclaims any intent or obligation to update these forward-looking statements. 2 Tefferi A, Rumi E, Finazzi G, et al. Leukemia. 2013;27:1874-81. 4 Vannucchi AM. Blood 2014;124(22):3212-20. 5 Passamonti F. Blood 2012;120(2):275-84. 6 Barosi G, Birgegard G, Finazzi G, et al. Br J Haematol. 2010;148:961-3. 8 Marchioli R, et al. N Engl J Med. 2013;368:22-33.